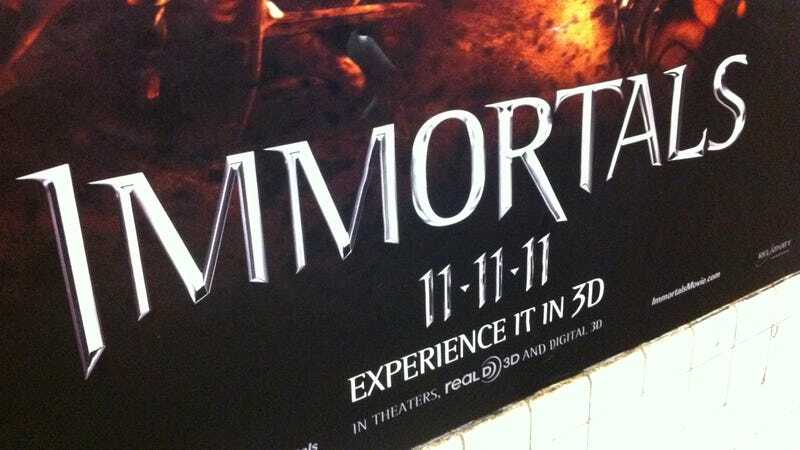 I may have made the connection because effective marketing has ingrained the 11/11/11 release date in my brain as the Skyrim release date since we all first heard about the game in December of last year. But once in a while, you see a font that looks positively inspired. So I had to check. Skyrim is being made by Bethesda, a company whose lawyers, we've reported recently, don't like perceived imitation. I think Immortals will be safe here, but for the sake of context, this is the first thing I saw this year that made me mistake something that wasn't Skyrim for something that is Skyrim. Immortals, according to IMDB is about: "a mortal man chosen by Zeus to lead the fight against the ruthless King Hyperion, who is on a rampage across Greece to obtain a weapon that can destroy humanity." It'll be out... oh, you can figure that part out.